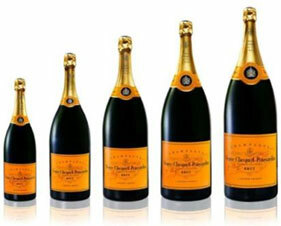 We sell large format (magnums, 3L, 6L, etc.) bottles. Large format bottles elevate any occasion. Bring festivity to your table or make a big impression with your gift-giving. Magnum: Latin for "great," this describes a bottle that, at 1.5 liters, is twice the standard size. Jeroboam: 3 liters. The name comes from the first king of the Northern Kingdom of Israel, who ruled for 22 years during the late 10th century BC. The name means "may the people grow numerous," appropriate to the number of servings the bottle yields. Rehoboam: A 4.5-liter bottle, named for the son of King Solomon and grandson of King David, who ruled the Kingdom of Judah in the 10th century BC. Appropriately for the bottle's size, his name means "he who enlarges the people." Methuselah: 6 liters. The oldest man mentioned in the Bible, who reputedly lived to be 969 years old and died around the time of the Great Flood that floated the Ark built by Noah, his descendant. The bottle named in Methuselah's honor holds 6 liters of Champagne. Salmanazar: A variation on the name of five different Assyrian emperors who reigned between the 13th and 8th centuries BC, this bottle holds 9 liters. Balthazar: The name of the third Wise Man who followed the Star of Bethlehem to the Nativity means "god protect the king." 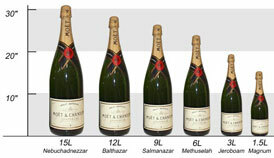 A Balthazar bottle holds 12 liters of Champagne. Nebuchadnezzar: The name of the greatest, most powerful of all Babylonian kings, who ruled from the late 7th to the middle 6th century BC. The bottle holds 15 liters. Melchior: The name of the first of the three Wise Men goes to the largest Champagne bottle, which holds 18 liters.